The two Chinese carmakers that have entered the Indonesian car market – Dongfeng and SAIC-GM-Wuling – have done so via different routes. The first one, Wuling, chose MPVs to penetrate the large and growing market, which has a preference for affordable people carriers. Dongfeng, via its DFSK (Sokon) brand, has the Glory 580 SUV as its maiden product. After the Confero and Cortez MPVs, Wuling might be moving to SUVs next. At the 2018 Gaikindo Indonesia International Auto Show (GIIAS), it previewed a “Wuling SUV” based on the Chinese market Baojun 530, which is also a SAIC-GM-Wuling product. Launched in China in March, the five-seater Baojun 530 measures 4,655 mm long and 1,835 mm wide, which is around the size of the 5+2 DFSK Glory 580. Both SUVs feature an Audi Q5-style wraparound hatch. Like the latest Hyundai Santa Fe, the top tier of lights is merely the LED daytime running lights, with the main beam situated below. In its home market, the Baojun is available in eight variants with a choice of a 1.8 litre NA or 1.5 litre turbo engines, paired to six-speed manual, automatic or dual-clutch transmissions. The petrol engine range of 1.8 NA and 1.5T is identical to the Glory 580, and the latter’s output is in the ballpark too at 147 hp and 230 Nm at 2,000 to 3,800 rpm. The front-wheel drive SUV is equipped with EPS steering, front McPherson struts and independent rear suspension. Available features include ABS, EBD, BA, ESC, hill hold control, electronic parking brake, front and rear sensors, reverse camera, tyre pressure monitoring system, six airbags, panoramic roof, keyless entry with push start, cruise control, an eight-inch touchscreen with navigation and a Harman Infinity sound system. In China, the Baojun 530 is priced from RMB 75,800 (RM45,162) to RMB 115,800 (RM68,994). 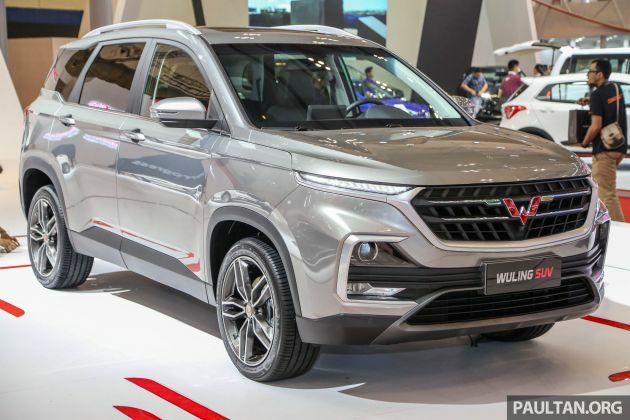 Specs for the Indonesian market are yet to be finalised and research is ongoing – officials say that the Wuling SUV will not be ready this year. Mazda+Hyundai grille with WWE logo & BMW interior. Err so typical of China. Wait till you see Geely GE. Lol..why not compare newer model than obselete model? China car makers are so clever. They really know how to penetrate a market. GE is no longer in production. Unstuck yourself from the past and come to the present. We wait for you. Mazda + Hyundai? check out DS’s grille. Especially DS 7 CROSSBACK. Far better than that crappy wau bulan design style. Why you diss Mazda’s wau bulan design? Waiting for ASEANNCAP test results 1st…. Sure better than any Volvo. Really? V40 got 5star EU NCAP. How many EU NCAP stars does this Woolie have? Ha ha ha. The Chinese car maker is smart to enter the Indon market with cheaper version of MPV/SUV(5+2 seater) that is affordable people carriers as most Indon has a large family. Maybe a mini bus carrying 10 people will be idle too! The invasion of Chinese vehicles into SEA is now here. For now, T/H/N has nothing to fear but things will change in the future. Why u bash Suzuki lord?